TRIVIA of Noh : Q150 : What is karagoto? | Home | Trivia | Q150 : What is karagoto? One might guess that “Yōkihi” (Yang Guifei) and “Kantan” (Handan) are classified as karagoto plays because of their titles, taken from the name of a Chinese heroine and a place in China, respectively. A famous piece for beginners, “Tsurukame” (The Crane and Tortoise; See Trivia Q142) is also a karagoto play. Meanwhile, “Kan-yō-kyū” (The Palace of Xiányáng), is based on the attempted assassination of Shi Huangdi and appeals to those with a love of Chinese history. One of the special features of karagoto plays is the use of exotic props and costumes. For example, the leading character of “Yōkihi” appears holding a tō-uchiwa (Chinese fan) in her hand. A play based on an Indian myth imported from China, “Ikkaku sennin” (The One-horned Immortal), is the story of a hermit who has a horn on his forehead, as its name suggests. 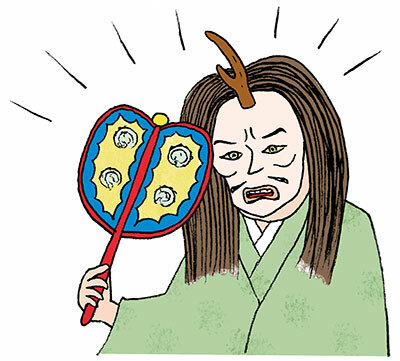 There is a special mask with a horn that is used only for this play. There are also several kyōgen plays that display influences from China. “Tō-zumō” (or “Tōjin-zumō”; Chinese Sumo Wrestling) tells the story of Japanese sumo wrestlers who beat Chinese opponents during their stay in China. It is a spectacular and fun play featuring a scene in which the chorus sings a song in gibberish fake Chinese.